BEAVERCREEK — Asked to describe what the difference in Friday’s football game was for his team, Fairborn coach Chris Roark sorta rolled his eyes and stated the obvious. “It was the 14 points Beavercreek (3-0) scored in about 15 seconds of the second half. That was the difference,” he said. 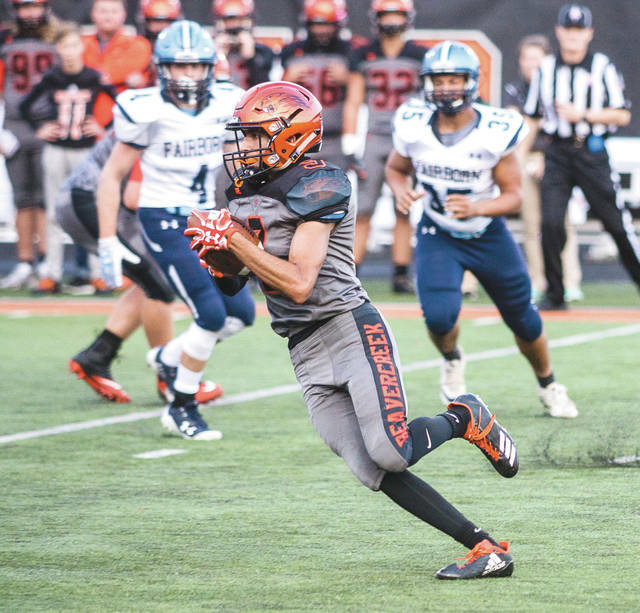 On a night where Beavercreek’s defense was putting pressure on Fairborn quarterback Wesley Watts for most of the contest, those 15 seconds turned the game in the Beavers’ favor in a 48-20 win Sept. 8 on Frank Zink Field. Leading a determined Fairborn bunch by seven points (20-13) at the half, two Bryce Neuse interceptions on two consecutive Fairborn pass plays led to 14 points for Beavercreek. The first Pick Six came with 8:35 left to play in the third quarter. Watts rolled to his right and, rather than take a sack deep in his own territory, he tried to underhand the ball to wideout Shaun Monroe. Instead, Neuse stepped in front of the pass and scooted around the left side for a 25-yard touchdown. Marcella Cash booted the extra point and the Beavers were now out in front 27-13 and had some breathing room. After a booming ‘Creek kickoff for a touchback, Fairborn (1-2) took possession again, this time on its own 20. Again Watts rolled to his right, again he tried to complete a pass to the right side — this time, a dump-off pass to running back K.J. Redmon — and again Neuse made some noise by returning another Pick Six, this one from almost the same distance. Beavercreek was suddenly up 34-13 and had all kinds of breathing room now. Beavercreek coach Nic Black liked the play from his defense, but said he was “annoyed” by a few lapses in concentration that led to Fairborn scores. Senior fullback Kaden Wenger had his second biggest rushing night of the season so far in the win over Fairborn. Wenger rushed for 224 yards and scored two touchdowns. His season best was the opening 235-yard effort against Xenia. In the loss, Fairborn’s Watts completed 13 of 29 pass attempts (with those two crucial picks) for a game- and season-high 190 yards. He completed one TD pass to Shaun Monroe, from 38 yards out in the first quarter. 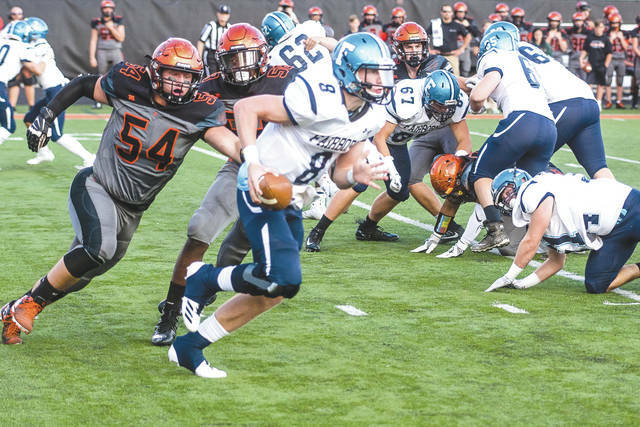 Fairborn takes to the road on Friday, Sept. 15 to play at Troy next week, while Beavercreek has a Thursday, Sept. 14 home contest next week against Lebanon. Beavercreek senior running back Kaden Wenger dives for the end zone pylon for a touchdown, during the first half of Friday’s Sept. 8 48-20 Beavers win over visiting Fairborn. Wenger unofficially gained a season-high 224 yards and had two touchdowns in the win. 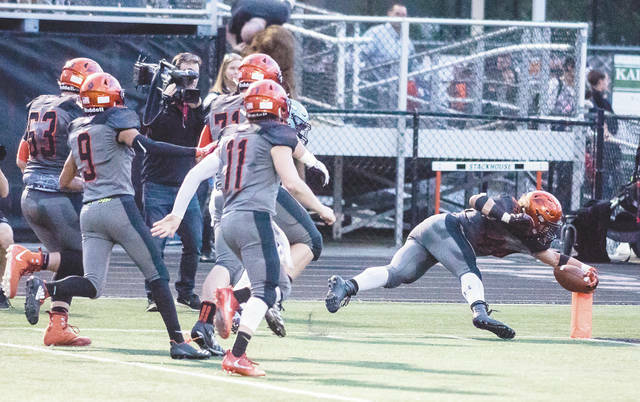 https://www.fairborndailyherald.com/wp-content/uploads/sites/50/2017/09/web1_WengerPylondive_PS.jpgBeavercreek senior running back Kaden Wenger dives for the end zone pylon for a touchdown, during the first half of Friday’s Sept. 8 48-20 Beavers win over visiting Fairborn. Wenger unofficially gained a season-high 224 yards and had two touchdowns in the win. Fairborn quarterback Wesley Watts runs to avoid the defensive pass rush from Beavercreek’s Noah Koenig (54) and Demetrius Hardaman (58), during Friday’s Sept. 8 high school football game at Frank Zink Field in Beavercreek. Watts threw for 189 yards unofficially, in the loss. https://www.fairborndailyherald.com/wp-content/uploads/sites/50/2017/09/web1_WattsRunB54B58.jpgFairborn quarterback Wesley Watts runs to avoid the defensive pass rush from Beavercreek’s Noah Koenig (54) and Demetrius Hardaman (58), during Friday’s Sept. 8 high school football game at Frank Zink Field in Beavercreek. Watts threw for 189 yards unofficially, in the loss. Beavercreek senior wing back Drew Nanda (9) takes a pitchout for a gain of 17 yards in the first half of Friday’s Sept. 8 high school football game against Fairborn. https://www.fairborndailyherald.com/wp-content/uploads/sites/50/2017/09/web1_B9pitchleft_PS.jpgBeavercreek senior wing back Drew Nanda (9) takes a pitchout for a gain of 17 yards in the first half of Friday’s Sept. 8 high school football game against Fairborn.